** Editor’s Note: The staff of Scienceline is taking a short break to work on future stories. In the meantime, we will repost some of the site’s most popular articles from the last six months. We will return to publishing new content on May 19. This article originally appeared March 14. Whether you are cresting the peak of a majestic volcano or walking on a city street, there are immense amounts of heat beneath your feet – enough to provide all the energy the human population will ever need. In most places, though, that heat is trapped by solid rock – unavailable to our carbon-choked, energy-hungry populace. But the power could now be unleashed. The 2009 Department of Energy (DOE) budget released in early February includes about $30 million for geothermal energy exploration – mostly for the construction of Enhanced Geothermal Systems (EGS) demonstration plants. This is the first step toward achieving enough clean, constant power from the earth to provide around 10 percent of our baseline energy needs – a goal put forward by a panel of experts in January 2007. Before EGS could be implemented, scientists would need to calm concerns about insufficient technology and the possibility of earthquakes at EGS sites. The allotted $30 million would also have to increase in later years to reach the $1 billion the panel report calls for overall. Still, many scientists view the project as our best baseline energy option. “We’re no longer limited by just discovering the Icelands of the world,” says Jefferson Tester, a professor of chemical engineering at MIT who chaired the EGS panel. The report estimates that by 2050, EGS could be implemented to a capacity of 100,000 new megawatts of power – more electricity capacity than all of the nuclear power plants in the United States combined. An Enhanced Geothermal System is a drilled and blasted version of natural geothermal systems like geysers and hot springs. After making a well, engineers pump water down to an area of hot solid rock, where it causes the rock to break up and become porous. The water then trickles through the rock fractures, heats up, and is drawn back through an uptake well to the surface, where its heat can be used to drive turbines and generate electricity. Because many areas in the United States have very hot rocks but not the water or pressure to drive that heat to the surface, EGS could dramatically expand the amount of geothermal heat we are able to harvest by forcing areas with heat potential to become productive. “Environmentally, [EGS] should be very, very positive if done right,” says Gerald Nix, a researcher at the National Renewable Energy Laboratory in Golden, Colo. The power is endlessly renewable and doesn’t generate large amounts of carbon dioxide or other greenhouse pollutants. Until late January, the United States’ main plan for clean baseline power was the development of clean coal technology, with the construction of a plant called FutureGen. But that project’s cancellation was just announced on Jan. 30, as was its possible price tag: $1.8 billion for 275 megawatts of capacity, or over 600 times more than EGS per unit of electricity. In contrast, the EGS panel report called for only about $1 billion invested over 15 years. Next to that, FutureGen would have looked like a $300 roast beef sandwich. Yet the DOE was prepared to invest heavily in the clean coal plant, while geothermal development has received only a small budget for the next two years. If 2009’s $30 million is only the beginning of the DOE’s geothermal support, as the EGS panel would hope, part of the $1 billion price tag would go to research and development. Without some advancement, as well as government support and subsidies, EGS may not be as inexpensive as anticipated. Still, Tester regards the panel’s budgeting and predictions as conservative. Right now, the drilling technology used for EGS is borrowed from the petroleum industry. Drilling in hard solid rock is very different from drilling in loose sediments or gravels, so the process is not as efficient as it should be. But Tester and other researchers are working to create drill heads that better survive the harsh trip down to the hot solid rocks EGS aims to tap, as well as improved drill housings and ways to turn heat into electricity. Scientists also need to ensure that underground sensors, which monitor the shape and path of fractures, are as efficient as possible. If the rock breaks one way, hot water will flow through well. If it breaks another way, it might not. Engineers need to “really learn how to enhance and manage the underground reservoir so it is a very effective and long-lived heat exchanger,” says Nix. 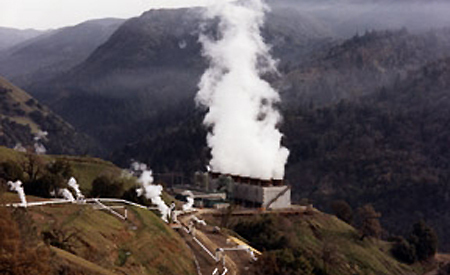 At this point there are some enhanced geothermal sites in the United States, most notably at The Geysers in California, where water pumping increases the yield of a natural geothermal system. But there are no projects yet at the level the EGS panel suggests. One huge issue that has come to light at EGS plants in the United States, France, Australia and Switzerland is the possible side effect of induced earthquakes. Small earthquakes occur in all geothermal systems, says Mark Anders, a Columbia University geologist. Some of these quakes are just vibrations of moving water and steam. But the kind of quake that shakes Californian cities, in which one side of a fault or crack slips against another, can also take place if the geothermal system is connected to an area with active faults, says geologist Charles Visser, who is collaborating with Nix at the federal laboratory in Colorado. Theoretically, a quake on a big fault could be dangerous to structures and human life. But a major quake requires a several-kilometer-long fault, argues Ernest Majer, a seismologist at the Lawrence Berkeley National Laboratory. Engineers know not to put EGS sites near large or dangerous faults, and the small cracks created by the system itself are not dangerous. “We can’t make faults as big as Mother Nature does … and there has never been a damaging geothermal earthquake anywhere in the world,” he adds. At Geysers in California, there are about 3,000 earthquakes per month, according to Majer. The largest, however, reached only 4.6 magnitude – big enough to be noticeable, but not dangerous. Majer is enthusiastic about how education and community involvement can help to allay earthquake fears. The quakes at EGS plants can be controlled and monitored for safety, and better research will help scientists and engineers understand how to make EGS plants even safer, he says. The most important next step, according to Tester, is to demonstrate that large-scale EGS is even possible and profitable. Read about geothermal energy in New York. Hot stuff Molika! love the roast beef sandwich analogy. concise and easy to read article with potentially groundbreaking info….unfortunately, it sounds like the oil giants that have the techno edge and $$$ will be most likely to get in on that proverbial ‘ground floor’…but, I guess you can’t blame Mother Nature for that, I mean, as you pointed out, it won’t be her fault. …imagine being able to go to depths where even more heat would be available to generate the superheated steam required to generate the electricity our electric scooters, cars and Who knows what. One obstacle to overcome would be the drill bits which would wear out ever more quickly as the temperature at the bottom of the hole increased. how many feet would a drill bit have to be able to drill in order to be considered economically acceptable? If a bore was drilled to the maximum economic depth, and at that point a different type of drill bit was used which would not be as quick as the first bit, but would gain that extra depth required to reach the balance point where super heated rock would provide enough heat to ‘power’ a heat exchanger efficiently enough to produce the required steam needed to generate electricity. The heat source would last longer, and it would prevent earthquakes. The slower bit would use high pressure water to cut the hole. It would cut into the rock slowly enough to allow the smaller rock chips to be washed back to the surface. The trick would be to get enough volume of water to cut the rock, and still remain water. At the point where it becomes steam, it would be unable to wash the cuttings back to the surface. This drill bit would require a massive and continuous flow of water. Once the hole is drilled to the required depth, a ceramic probe laced with enough heat exchanging tubing would be put in place which would prevent the whole apparatus from melting. One further thing would be required…a way to lift that heat exchanger from depth in the event the heat exchanging medium stopped flowing for whatever reason. It would need to be able to be brought up the bore high enough to prevent melt down. Once the heat exchanging liquid is reintroduced, it could again be lowered back to the hotter depth. This is encouraging and depressing at the same time. 30 million is a tiny drop in the bucket compared to the billions spent to subsidize coal and oil. The US should be spending billions to develop EGS as quickly as possible. It is the only clean solution that can actually replace coal for generation of baseload power we can depend on. Since most of the action goes on underground, it has much less visual impact than wind and solar and it is solid and dependable. It takes 5 megawatts of solar capacity to generate the same number of kilowatt-hours per year as 1 megawatt of geothermal. It takes 3 MW of wind to do the same job because the ratings are for peak conditions. On a bad weather month both can fall to a fraction of their rated power. Geothermal is continual and dependable, often achieving 95% capacity factor. Geothermal plants are cheap in the long run because they require no fuel and produce no pollution. Heat inside the earth is continually replenished by atomic decay. We need a Manhattin Project approach to jump start geothermal development instead of wasting billions on unworkable programs like “clean coal” and hydrogen which can never work. We have already been injecting water into the earth to squeeze more oil out of depleted wells for decades. It works and doesn´t cause earthquake problems. The meekness of this approach is really pathetic when time is running out and all we do is keep cranking out filthy billion-dollar coal power plants. Strange, how all these fantastic technologies surface the moment a few futures’ speculators drive up the price of our favorite carcinogen, benzine molecule laced oil. Here’s hoping that the price of oil slowly moves upward to the point where newer, more diverse energy technologies, employing more, smarter, North American people emerge and dependency on foreign supplies no longer threatens the north American continent. we will win this one! Wow, this is a great read. I had never heard of this being actively done, though I figured at some point scientists would start tapping that resource. I think it’s great that this is an unlimited energy source, but I do have my concerns. I just have this image of the Earth being sucked dry and deflating like a balloon once we use up all of its natural resources. But, I do think it’s great that using this form of energy will be slightly better in the long run, in terms of creating less emissions/pollutants/etc. How green does everyone here try to live green? How many of you all out there use regular oil heat? If so, I think you all should read up on something called bioheat. It’s an alternative to regular oil heat. For one, it’s clean burning, made of sustainable resources like plant and vegetable oils, and is pain free when switching over. If you want to read up more about it, just go on to http://oilheatamerica.com/index.mv?screen=bioheat Also, I work with NORA to bring this info to you! The drill bits may not be an issue anymore. There is a type of drill bit that was developed at SIU, funded by the Illinois Clean Coal Institute, that is 800 times more wear-resistant that tungsten carbide/cobalt bits. The test bits were manufactured at Robert Bosch Tool Co in Louisville, Ky. They are a mixture of nickel aluminum metal carbide and diamond powders. Even a 2400 C the diamonds do not decompose to graphite. These bits can easily cut through cast iron and granite. Time will tell if massive geothermal usage becomes practical. n Enhanced Geothermal System is a drilled and blasted version of natural geothermal systems like geysers and hot springs.